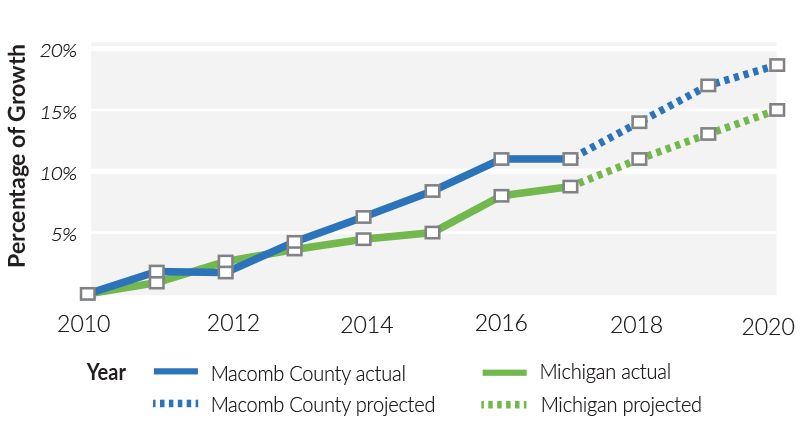 Healthcare and social assistance is an emerging and fast growing industry cluster within Macomb County. These establishments offer a fully integrated continuum of care including everything from general hospitals to specialty care. With four top-rated hospital systems that specialize in areas such as cardiac care, cancer treatment and orthopedic surgery, Macomb County provides access to world-class health care. 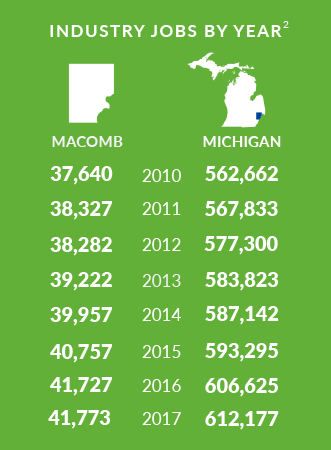 With a regional population of nearly five million, Macomb County’s vast spectrum of healthcare providers link residents to affordable and quality care options. 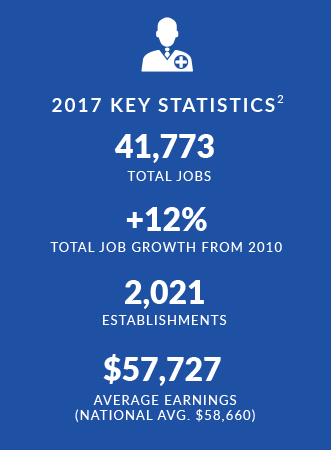 Macomb County has shown healthy growth in the industry since 2010. During this time employment within the industry has grown by nearly 5,000 individuals. This 13.3 percent growth outpaces a statewide average of 9.5 percent. Home health aides, registered nurses and personal care aides are the careers experiencing the most growth. Macomb County is serviced by an expansive network of universities and colleges focused on educating a highly skilled workforce. Many are working on the next advancements in life sciences, healthcare device manufacturing and specialized care. Macomb’s four hospital systems are a major component of the county’s the healthcare industry. Offering a combined 1,590 beds across the campuses, these centers have been recognized as leaders in treating a number of specialties. McLaren Macomb is a 288-bed acute care hospital located in Mount Clemens. McLaren Macomb provides a full range of services including cancer and cardiovascular care. McLaren Macomb also has top-notch surgical services using state-of-the-art technology. With more than 2,000 employees and 420 affiliated physicians, McLaren Macomb is one of Macomb County's top employers. St. John Macomb-Oakland Hospital offers 535 beds in Warren. The hospital employs 436 nurses and associates, 600 volunteers, 195 residents and more than 1,200 physicians in over 45 specialties. St. John Macomb-Oakland Hospital, houses Centers of Excellence in cardiovascular services, including open heart surgery, cancer care, and neurosciences. The 349-bed Henry Ford Macomb Hospital in Clinton Township is one of only 33 hospitals recognized nationwide for quality care with the prestigious Leapfrog Group 2008 Top Hospital Award. Also in 2008, its Heart and Vascular Institute earned designation as a national Top 100 Cardiovascular Hospital for the second consecutive year. Other specialties include a cancer center; birthing center with 18 labor, delivery, recovery and post-partum suites; 42-bed inpatient rehabilitation program; ambulatory surgery; and two new robotic surgery systems that allow surgeons to provide the most advanced cardiac, gynecologic, prostate and thoracic procedures. Under the Ascension name, this is a 376 bed facility that offers Centers of Excellence in cardiovascular services, cancer care and neurosciences. The hospital has earned the prestigious three star rating from the Thoracic Surgeons and is an accredited Chest Pain Center with Percutaneous Coronary Intervention. In November 2017, the hospital broke ground on a $48.1 million expansion, changing its east tower from four to seven floors. The addition will provide 75 new private rooms and 48 renovated private rooms, bringing the total private room count to 220. In April 2018, McLaren Macomb began a $68 million expansion of its emergency and trauma center that will make it the largest in Macomb County. The project will be completed in 2020 and will double the size of the existing emergency area to 43,735-square-feet with a six story building. The lower level will house a training and graduate medical education center for more than 100 resident and fellowship physicians. The additional space will be utilized for the growing demand for emergency and trauma care in the county. Total Sports Park is an 80 acre site that is devoted to physical well-being. Twenty-four outdoor soccer fields and a brand new indoor facility, which opened in June 2018, will house soccer, volleyball, basketball, football and dance teams. Currently, the Park has classes in yoga, spinning and a boot camp that are all open enrollment. In the future, the Park plans to host international players and physical therapy in case of injuries. It will also host soccer tournaments for 40,000 people.